ASPIRE55 is offering 10 weeks of free strength training workout sessions (valued at $750) for members who are interested to be part of a research trial to measure the benefits of strength training to older adults, particularly for less active older adults. 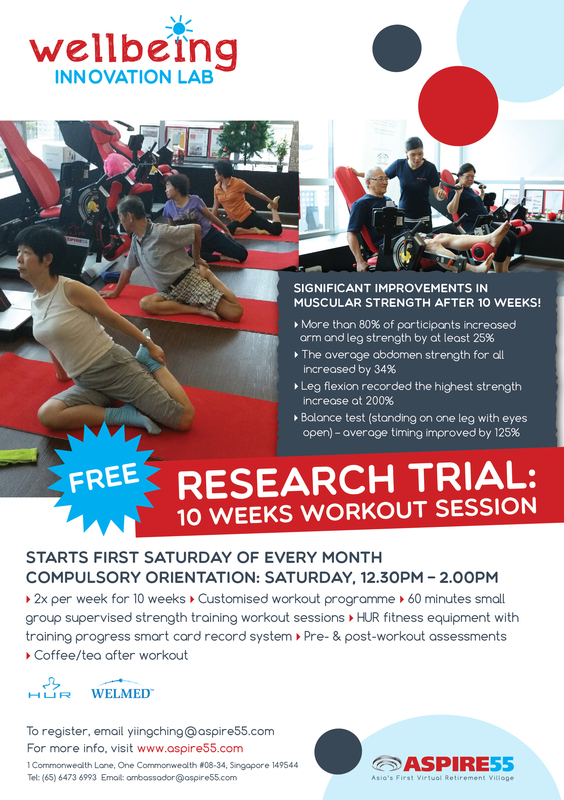 This research trial will start from 1 February to 9 April 2016 (10 weeks) and participants are required to commit to attending workout sessions twice a week for 10 weeks. Registered participants are required to attend a compulsory Orientation on 23 January 2016, 12.30 - 2.00 pm at ASPIRE55 Wellbeing Innovation Lab, One Commonwealth.